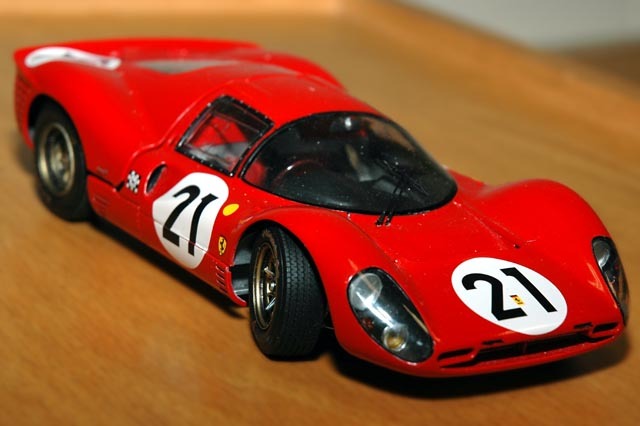 Not content to build one of the two versions (number 19 or 24) for which Fujimi provided decals, Gordon opted to replicate the number 21 car driven to a class win by the team of Ludovico Scarfiotti of Italy and Mike Parkes of Great Britain in the 1967 edition of the 24 Hours of Le Mans. The P4 was Ferrari's response to the severe victory of Ford's MkII victory at Le Mans in 1966. After Ford's success, Enzo Ferrari directed Mauro Forghieri, the Technical Director of Ferrari's Maranello Racing Department, to build whatever car he wanted, as all Mr. Ferrari wanted was to win in 1967. Forghieri set about improving upon the P3 weaknesses while capitalizing on its strengths. His efforts resulted in the P4 which boasted a greater power-to-weight ratio.